Ultimately, it is hard to beat wedding photography on the shores of Puget Sound, and this day offered stunning views of the sound from start to finish. 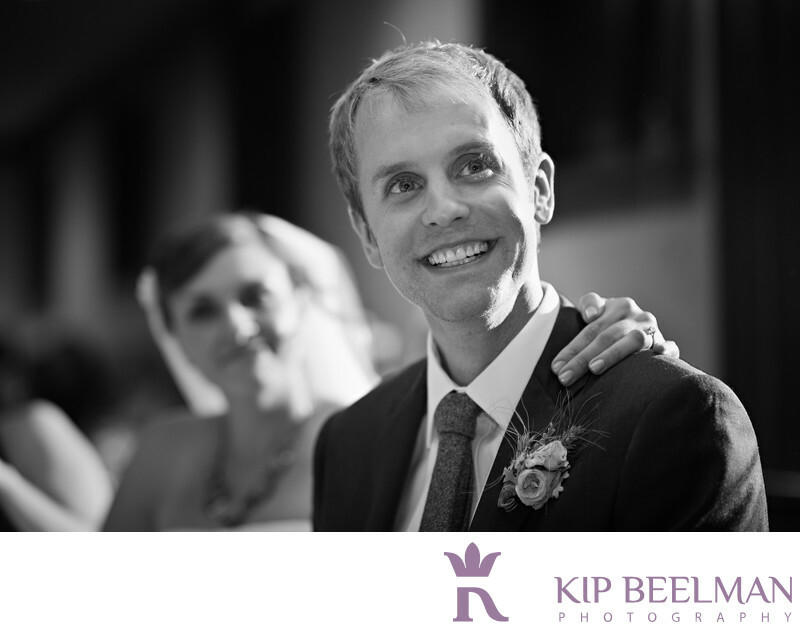 This charming smile from the groom was elicited as his older sister offered a toast that was a little more of a roast. She recounted begging her parents to return her newborn brother to the hospital after they brought him home the first time but concluded with some endearing words for the bride and groom alike. I think his smile really tells it all. Rosehill Community Center wedding photography took place in Mukilteo, Washington, about 45 miles northwest of Seattle, and delivered jaw-dropping views of Puget Sound from the grounds and the center’s panoramic deck. We showcased the couple and the setting amidst some great modern architecture which combined warm timber elements with glass, concrete and steel – a remarkable juxtaposition of something old and something new. Waking on the water, the wedding party got ready at the Silver Cloud Inn, which fit right in with its beach theme and bright rooms. We continued on to the Rosehill Community Center with its sweeping views of Puget Sound. Location: 304 Lincoln Ave, Mukilteo, WA 98275. Keywords: Hall Wedding (21), Mukilteo (3), Rosehill Community Center (3).